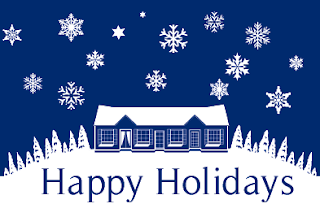 Holiday shopping, decorating, baking, rushing...who isn't busy this time of year. Well I certainly am more busy than ever, with all of those things plus raising 4 kids PLUS illustrating. 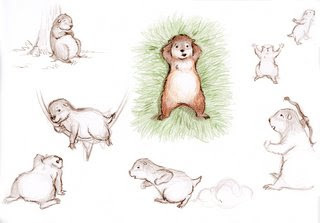 I signed a picture book deal with a large publisher and I have just 2 months to complete an entire book. I'm working like a mad woman. But in-between all that, I am also trying to find time to give back. Just a little over a week ago, I participated in a fund raiser for a local school. They had an art and basket auction. The baskets were donated to the school (filled with fun stuff) and then auctioned off silently. Then a bunch of local artists came in and painted pictures on the spot to be auctioned off at the end of the night. Here is the piece I painted (something for a little girl's room...Cinderella). It brought in a bit of money for the school and I felt good being able to help out. 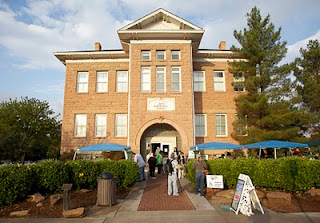 My husband came and helped me out at the Book Festival in St. George last weekend. It was great fun. I presented to a room of about 30 adults and children. I was surprised that many actually got out of bed at 9am on a Saturday morning. I hope they weren't disappointed. I always have fun, though, talking about what I love to do...illustrate. Here are some photos my husband took. 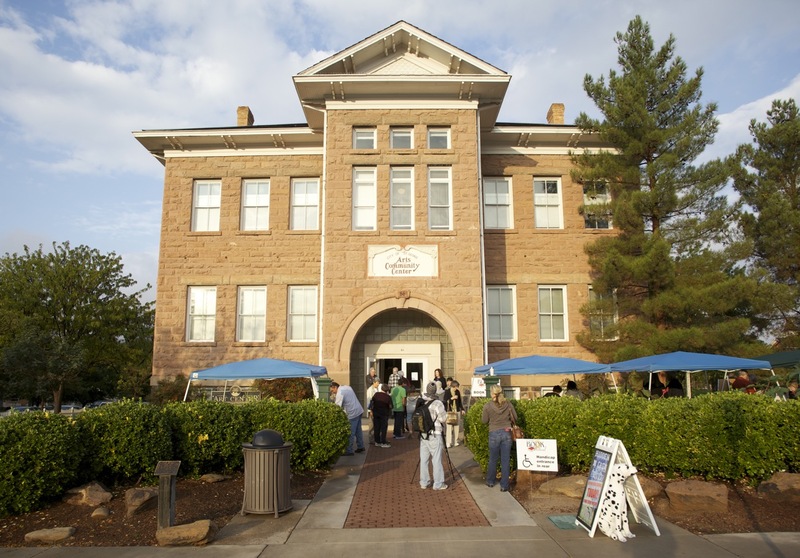 The Community Arts Building where the festival was held. One of my books for sale from the book seller. Reading a book during my presentation. Signing books afterward. It's so fun to talk to and meet the people. 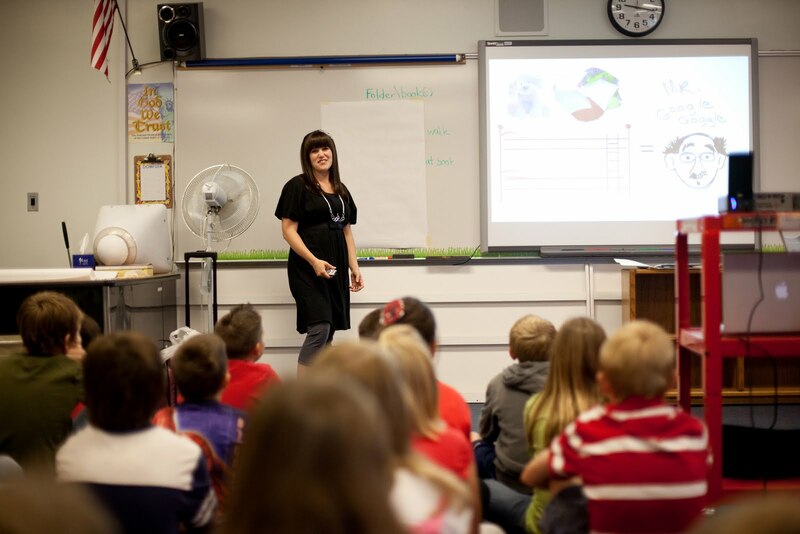 I had the great opportunity to do several presentations at Red Mountain Elementary School in Southern Utah today. The teachers and students were absolutely wonderful and well-prepared for my visit. I couldn't have asked for more from them. 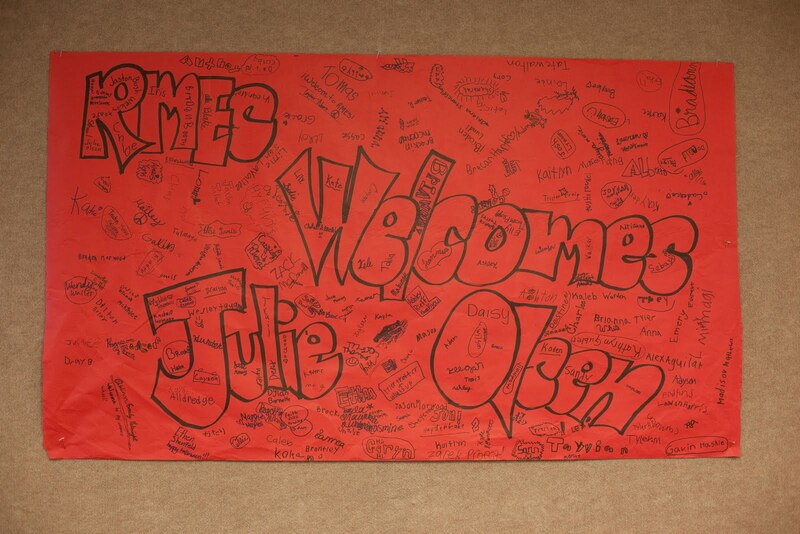 They welcomed me with this sign signed by all the 2nd through 5th graders. I shared with them all about how I became an illustrator and what it takes to illustrate (and write) a picture book. The kids were great listeners, had all the right answers, and the best questions. Then the kids helped me create a whole new character. They created a boy named Crew who was going on a trip to San Diego, and a Bear named teddy who was going to Florida, and a girl named (the best name ever) Julie who was going to Antarctica. Good job kids! I'll post a short video later. Thanks again, Red Mountain Elementary, for letting me come share my world with you. COMING SOON! "Tickle, Tickle! Itch, Twitch!" The first book I wrote AND illustrated is due to hit shelves November 1, 2010. 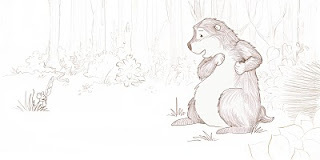 Gus the Groundhog It's a really fun page-turning, read-aloud picture book that ends up teaching about friendship, judging by appearances, and even some language development skills along the way. Watch the trailer below. 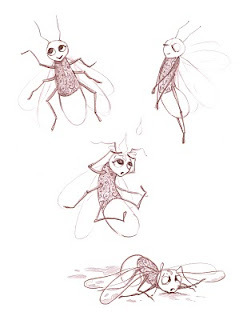 So for my firefly (see last post) I needed a design on her thorax...something that reminded me of jewelry designs/etchings. So I went into Adobe Illustrator and created a design with swirls and strokes. Here's what it looked like. Then I simply selected the object in Adobe Illustrator, hit Command C (copy), and then in Photoshop I hit Command N (for a new file), Yes, and then Command V (paste). It pasted the design onto a transparent layer. Then I hit Command A (for select all), then Edit-Define Brush Preset, name the brush...AND WAHLAH! the brush shows up in your brush pallet. Pretty darn awesome. I know a lot of you may have been doing this for a while, but I never have. I've simply downloaded brushes from the internet. Now that I know how to make my own license free brushes, I think I'm going to have fun with this. Try it out. Boy, having a newborn really throws your routine off. ("Duh!" you may be saying) But I'm starting little by little to work back into things. I'm currently working on a personal project, a book I wrote and am working on illustrations for. It's about a little firefly who thinks she's "all that." 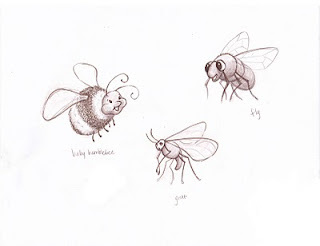 So here are my character sketches of her and then of her 3 supporting characters, baby bumblebee, fly, and gnat. If anyone would like to get books in the hands of underprivileged children AND learn more about breaking into the children's publishing industry, then this is the event for you. 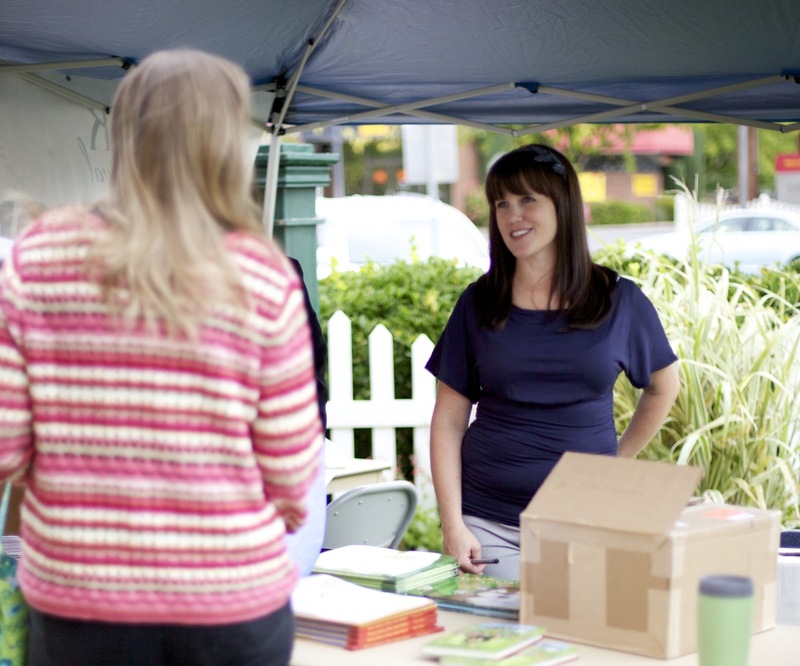 Rock Canyon Writing for Charity is sponsoring a one-day event designed to get books into the hands of kids who need them most. It's on August 21st in Sandy, UT at the Waterford School. Our goal is to give books to all of the kids in at least ten of the lowest socioeconomic populated schools in the state. That would be approximately 6,000 books to 6,000 kids. And not just any books, but books by Utah authors, their neighbors. Where possible, these books will be signed and the author will speak to the kids. 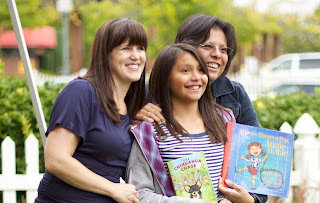 Our hope and our expectation is that by giving kids their own books, and making these connections, we will spark an excitement for reading, and an understanding that writers are normal people, like them, and that writing is something they can do too. Click the button to donate, register or find out more! Here's what I've been working on recently...a true endeavor in creation. We welcomed our new son into the world just one week ago. (Hence the lack of posts recently). See how I often work on two illustrations at once...more, going back and forth between them. While a background dries on one, I move to the other. Enjoy! This will make no sense to many of you, but after you check out THIS BLOG, you'll understand a bit more. I've included a little video of part of the painting process I did for this one...all digital in Corel PAINTER 11. (Click on the lick at the very bottom of this post to see the video) Now, before any Twilight fans are offended, this is all in jest. 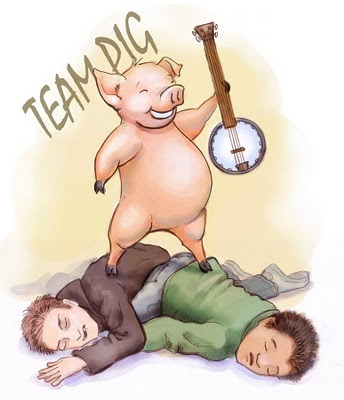 In the spirit of "Team Edward" vs. "Team Jacob" I made a "Team Pig." I wanted to get in the spirit of the summer blockbuster. Hope you enjoy. You have to click on the link to see the video of the digital painting process. So, if any of you have viewed the second and third recordings of my paintings on Ustream, you saw me working on the following illustration. Well, I thought I'd post the final result for those viewers. 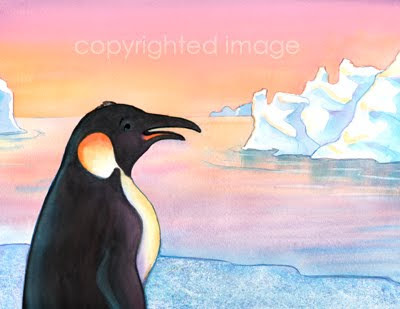 This is for the upcoming book, "The Littlest Emperor of Antarctica," published by Marshall Cavendish, 2011. I post this here to show the little bits of digital manipulation I do after the painting stage. 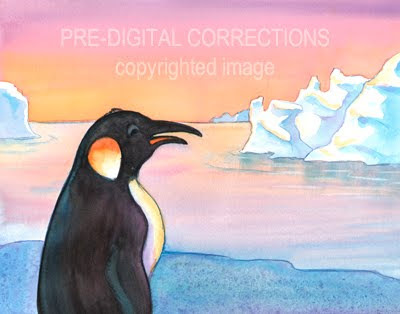 I added texture to the ground ice/snow, cleaned up the horizon edge, enhanced the colors in the penguin a bit and darkened some areas of the water. Enjoy. 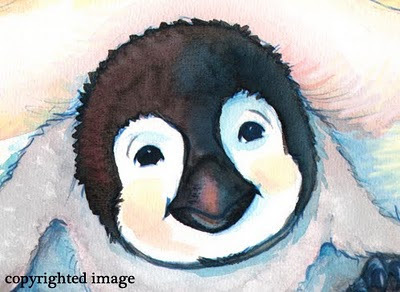 Today June 28th at 2pm Mountain Time, I will be broadcasting live from my studio...painting illustrations for "The Littlest Emperor of Antarctica." So click on the video stream at the top of the blog at 2pm for the live show. UPDATE: unfortunately the record button did not get pushed correctly (by me) so this part 2 of the live broadcast will not be available for later viewing. Sorry! 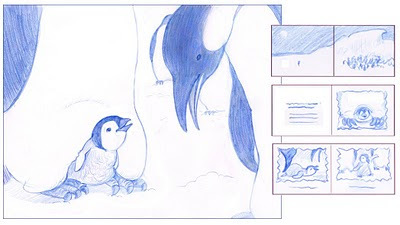 But I did broadcast another one right after to show the beginning process of another illustration for the penguin book. So even though you won't see the finish from the first illustration, there is a new video to see. 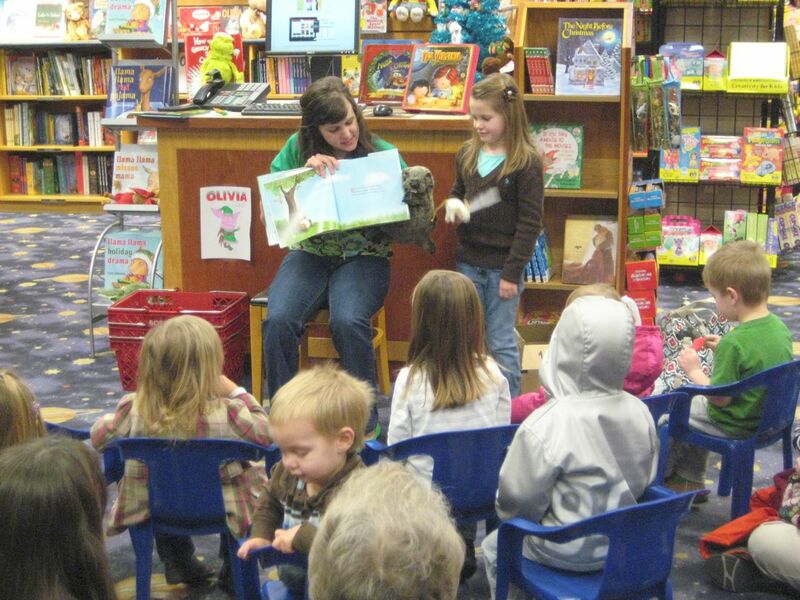 This Saturday, June 26, 2010 from 5pm-7pm The King's English Bookshop in downtown Salt Lake City will be holding a huge book launch party and signing for "The Chihuahua Chase" by A.E. Cannon, illustrated by me, Julie Olson. But starting at 4pm and going til 8pm, they will be holding their summer reading program's block party as well. So come join the fun! And enjoy this little book trailer to get you ramped up. 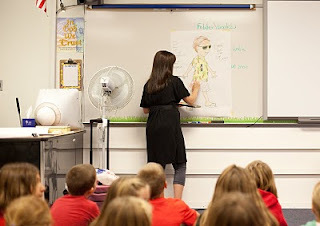 Well all this week I am helping out with the Writing and Illustrating for Young Readers conference in Sandy, UT. I fortunately get to assist in Kevin Hawkes' illustration workshop every morning and then attend workshops in the afternoon put on by amazing writers, illustrators, agents, editors...it's awesome! 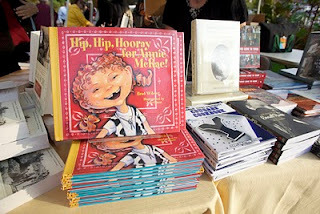 The best part is hanging out with people who are passionate about what I love...children's books. I become inspired and rejuvenated (although exhausted at the same time). During morning workshop, I get to listen in and then I just work in the back of the room on my personal current book job (the penguin book, mentioned in other blog posts). Here's a close up of the little baby penguin. I can't show you final images right now, but hopefully you get an idea of the feel and look from this close up. In addition to the conference, I was put in charge of a potluck mingle for all the local professional authors and illustrators as well as librarians, booksellers, publishers and all the visiting presenters to the conference. 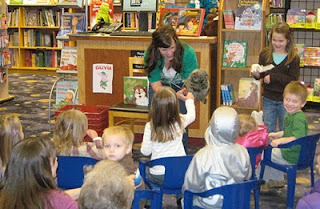 "The King's English" Bookstore in Salt Lake City hosted the event and it was a lot of fun. We have AMAZING talent here in Utah I must say. So many award winning children's book authors and illustrators. But now, I am worn out. It's time for some rest before beginning again tomorrow. But I will enjoy the next three days as much as the first two (and thankfully get some work done as well). I would like to thank my husband, mother-in-law, and babysitter for taking turns watching the little ones at home while mom's not in the home studio. Getting out and socializing with my peers has been nice. We illustrators get a little lonely in our studios from time to time. 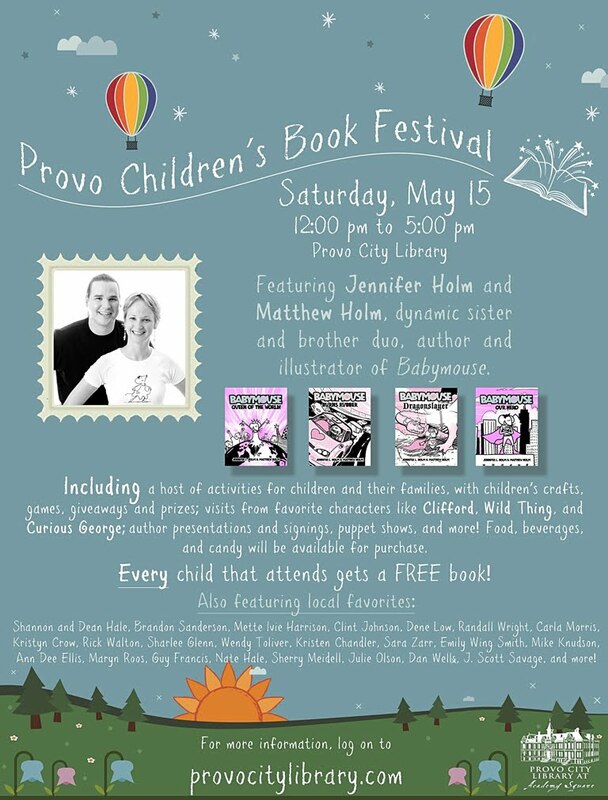 I, along with AMAZING authors and illustrators, will be presenting at this year's Library Book Festival in Provo, UT. Don't miss out. Every kid gets a free book and the chance to meet and hear from some great authors and illustrators. Hope to see you there! The Provo Children's Book Festival celebrates the world and wonder of children's books. 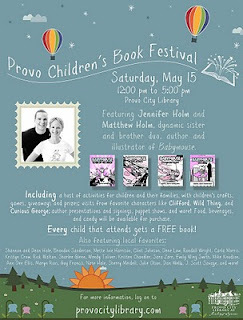 With a bevy of talented authors and illustrators in attendance each year, crafts, games, and giveaways; storytimes and puppet shows, visits from favorite characters, and more, the Festival is fast becoming an annual Provo tradition. 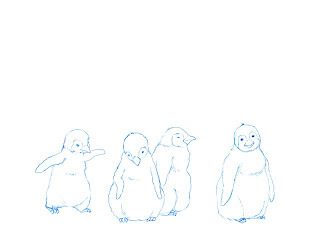 I turned in all the sketches for the penguin book I'm working on for Marshall Cavendish. They sure are cute little critters. Now I need to paint them one full spread of one of the interiors so they get an idea of my color and style for this book. I haven't posted to IF for a while. But here's one for the theme "linked." 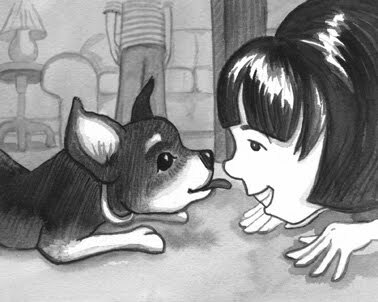 It's an illustration for the upcoming book, "Chihuahua Chase" by A.E. Cannon, release date, June 2010 published by Farrar, Straus and Giroux. And check out my post below about an awesome conference coming up! I'd like to announce a little fun give-away drawing I'm doing. 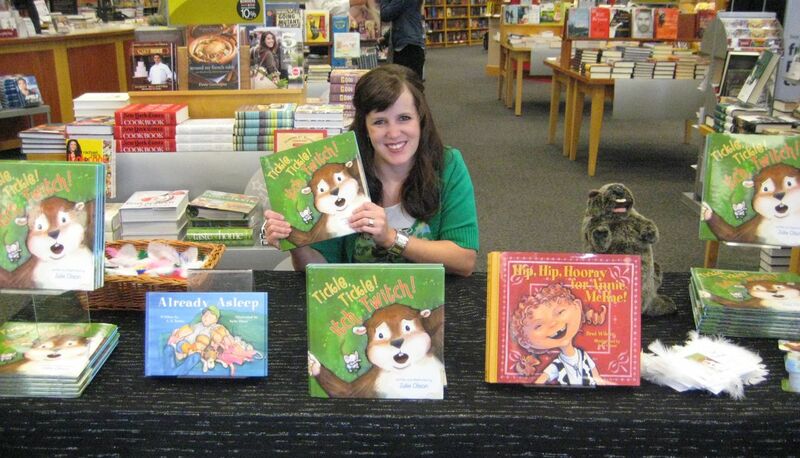 For anyone who blogs about, tweets about, or posts a facebook message about the upcoming Writing and Illustrating for Young Readers Conference, with the link to the conference website in their post, will be put in a drawing to receive an autographed copy of "Hip, Hip Hooray for Annie McRae!" and another drawing for an autographed copy of "There's Always a Way, Annie McRae!" So put the following link in your post, and then post a comment below with a link to where you posted. And check out the conference yourself. It's an AWESOME opportunity to learn, network, and hear from great authors, illustrators, a literary agent, and two editors from New York. It's priceless! I just wanted to make you all aware of a GREAT conference for you or anyone you know who is interested in writing or illustrating for the Young Adult or Picture Book Market. This conference has traditionally been held at BYU for years and years. However, because of the growing nature of the conference, it had to be moved to another facility. It's still run by the same great organizers and still has an amazing list of presenters. Here's the information on the conference. I just want to encourage you to spread the word to those that may be interested. It's an AMAZING opportunity. Now, I'm especially talking to you illustrators on this list: You've got to sign up for Kevin Hawke's morning workshop classes. He's an amazing illustrator and is ready to teach us all so much. And all you writers, just look at the list of faculty you have to choose from! The For Young Readers annual writing and Illustrating workshop brings together writers, illustrators, agents, and editors to explore craft, genre, and current publishing practices. Full-day participants spend their mornings in small workshops led by award-winning faculty (see the list below or go to the website for full bios). 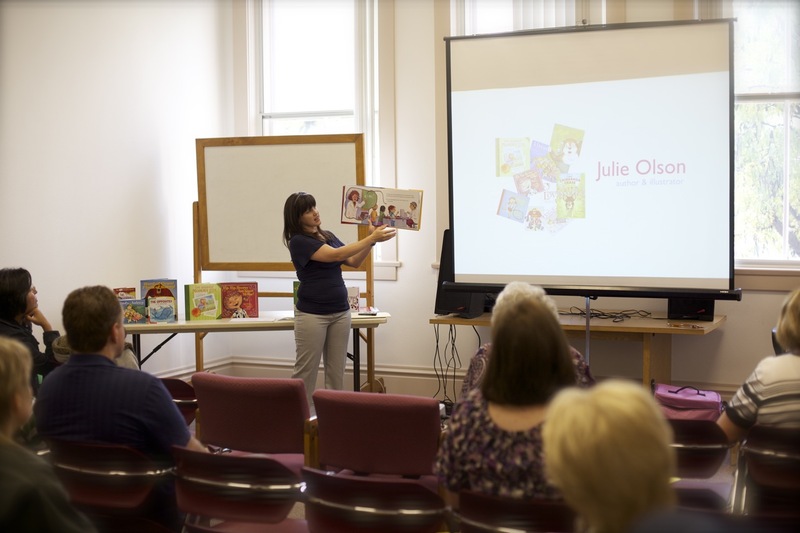 Both full- and half-day participants enjoy afternoon plenary sessions by national children's book editors and an agent, as well as breakout sessions by our workshop faculty and guest presenters. The keynote address and book signing are open to all conference attendees. Mary Kole, Associate Agent at Andrea Brown Literary Agency, Inc. I just thought I'd let you all know, I'll be presenting at Timberline Middle School in Alpine, UT tomorrow morning along with author Brandon Sanderson. I definitely don't have the following that this amazing fantasy author has, but I'm happy to share my knowledge about picture books at the school's writing conference. I love going to schools and sharing my love of books and illustration with the kids. Hopefully I can inspire some future writers and illustrators. Someday, I'll post a video of my presentation so you can all see what I do. I just need to get someone to come along and tape it for me. Any volunteers? I was asked to give an interview to our local newspaper by journalist, Marilyn Nielson. Here's what she wrote up about me. It's all about my job, how I got started, and what I do now. 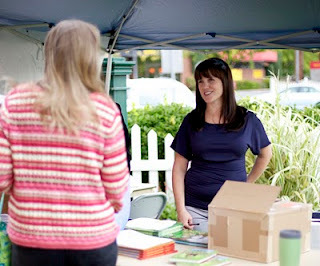 The photo was actually taken by my husband, photographer Rhett Olson (see his website) at a book signing. Click on the image to see it full size and read the article. 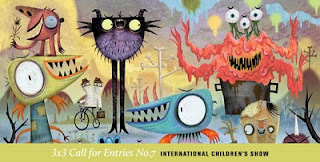 "The 3x3 Children’s Show is the only truly international competition for illustration. No other show is as completely international as ours. While many shows showcase the work of their own country’s illustrators, 3x3 features the best work from all over the world." Even if I don't "win" or even make it in, my work gets seen by editors from some great publishing houses. So wish me luck. I entered in the Book category...you submit the cover and up to 4 interiors. The work had to be published or produced in 2009. So I submitted work from the book I wrote and the chapter book I illustrated (both produced last year, hitting shelves this year. So after reading all that or DOING all that (which of course usually can't be done well in only 15 days), you have to decide for yourself whether or not this is the thing for you. It's a tough road but it's so exciting too. You won't become rich or necessarily famous by doing picture books...they are probably the least appreciated form of literature out there. But you can gain a great sense of satisfaction and accomplishment from creating wholesome, fun, inspiring products to put out into the world. GOOD LUCK! 4. BEGIN AGAIN, WHILE YOU WAIT: during those months of waiting and possible rejection, get started on another book. Then you won't be obsessed and frustrated with the long process. Just know, most of the time, a picture book takes YEARS to create, to get to a publisher, to get through a publisher, and out on shelves. It's usually at the least a 3 year process (and that's fast). 3. WAIT AND WAIT AND WAIT: Give the editor at least 3 months to respond. After that, it is fine to call and ask them what they thought of your submission. They are VERY busy people...overworked and underpaid. But they love what they do and want to find good work. Just respect them and their time. If they have feedback for you, that is REALLY positive. Take it and make your work better. If they don't, that means they didn't even like it enough to try to help make it work. That doesn't necessarily mean your book is bad though. It could just mean it's not the book for that editor or publisher. But feel free to ask them specifically what you can do to make it better. Ask them if they ever see it working for their publishing house. 2. SEND OUT THE DUMMY BOOK: If you have an agent, great. They will do this for you. However, if you don't, the work is up to you. Find a list of publishers who publish books in the same genre and send it to their head editor and assistant editors. The lists can be gathered through joining the Society of Children's Book Writers and Illustrators (www.SCBWI.org) or checking out CBC.org online or by researching in "Writers Market Place" (however that publication is often out of date). When mailing your work, you put a cover letter in the envelope along with a report style printout of just the words (double spaced, 1" margins, start half way down with title and name, put your contact info at top left and the word count top right) and your dummy book. In the cover letter, type it business style, introduce yourself and any credentials in the first line (publication credits, degree, or experience). Then briefly explain what's enclosed. Tell what the story is about in one sentence. Thank them for their time and close with Sincerely. Include a self-addressed stamped postcard for them to return to you with their comments. 1. HAVE A WEBSITE OR BLOG: Make sure before you begin submissions, you have a professional website or blog the editor can refer to if they want to find out more about you or your work. If you are an artist have your portfolio out there. If you are a writer, have some other samples. Think of it as your online resume. Best foot forward. 4. CRITIQUES: This time you need critiques especially from other illustrators. You've had writers critique the words, now have illustrators critique your book. Be ready to make changes. ALWAYS be ready to make changes. 3. CREATE A DUMMY BOOK: this is a book in sketch format. I scan in all my sketches to the computer and type in the words on each scene...knowing full well that the designer at the publisher will put it all in place in the end. It's just there to hold space and show there is space for the text...and to read the story along with the sketches. I also mock up a cover, a title page and leave space for a copyright info page and dedication. I do try to start smaller elements of the story or art in illustrations on these pre-story pages. It adds a fun element to the book. I load the pages into a program called "IN DESIGN" by adobe and this makes printing out the pagination and dummy book much easier. (You can do tutorials online for it if needed...but you can also just cut and paste the printouts onto the proper pages in a pre-stapled blank page book). It's hard to describe the actual creation of the dummy book in words, but essentially, think back to your gradeschool days and those little books you used to make with your own stories and illustrations. That's what this is. After I print out the pages I staple them in the middle and have a small sketched out book. (I usually only print it at 1/3-1/4 of the actual size of the book. These are little examples of dummy books. Only the one with the sketched cover is ready to be sent out. The others are my own working copies, from the VERY rough one on scrap paper and sharpie, to the printed text version where I'll tape in copies of sketches to check flow or use as a half-way point, to the final one with text and sketches. 2. FULL SIZE SKETCHES: After I've worked out any design flaws in the thumbnail stage (as many as I notice), I begin drawing each scene full-scale. Some illustrators do a mid-size drawing, however, I put a lot of detail into my thumbnails so I can skip the mid-size stage. It's important you draw these to scale. Note that a standard vertical picture book is about 9 inches wide by 10 inches tall for each single page and a horizontal is just the opposite. A Square book is usually 9x9. 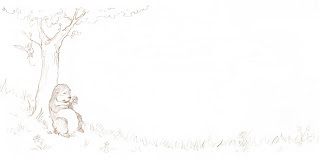 So for a double page spread (the book laid open and the illustration filling both sides) the illustration needs to be 18 inches wide for the vertical books and 20 inches wide for the horizontal books. Just know that even after all this, a publisher still has the right to request a different page size. You just draw at your ideal for the story. If you want the picture to fill the whole page, bleeding off the edge, make sure to draw it a quarter inch beyond the border on all sides. At this point it's really fun to see all the work start to come together. Here are a few examples of full size sketches...(if you go to the previous post, you can try to find the thumbnail it was drawn from). 1. THUMBNAILS (STORYBOARDING): After you feel like you've done all you can do for the writing, the real fun begins...the actual illustrating. However, this first stage is the most difficult and thought intensive for me. It's where all the hard work happens in illustrating. All the problems and questions have to be solved in regards to art in this stage. Even though you try, some still may arise later. However, they usually aren't so major if you do your work here. I begin by sketching tiny scenes (tiny because it takes less time to draw small than draw big) of each page in a rectangle with a line down the middle. This rectangle represents the book opened up. The line down the middle is the center of the book where the pages are stitched together. This is called the gutter. When designing your scene, you don't want to put any important elements in the gutter...they'd get warped and possibly lost as the pages stitch together. You also have to design room for the type. Whether it's going over the illustration or outside of it in the white space, you need to know where you are putting it. 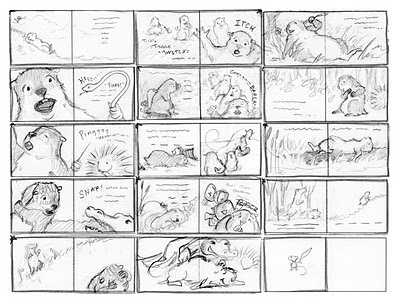 I draw many thumbnails for each scene for the entire book. Then I choose the designs I like the best and line them up to make sure I have a good design flow and variation. At this point I could go on and on about design and what goes into that, but I'd bore the artists and confuse the writers. Just know, you can't have every page from the same viewpoint and your design needs to reflect the mood and the style of the scene as well. 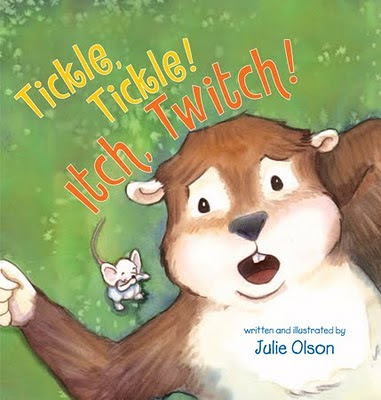 Here's an example of the chosen thumbnail images all in order from start to finish for the book I wrote and illustrated called "Tickle Tickle Itch Twitch." Notice the variation in size and layout and resting and action scenes. These all fit on an 8.5 x 11 sheet of paper...that's how small they are. But look at the detail you can cram in. 5. CRITIQUES: once you've done all you can do for the words and developed a few rough idea sketches of the character and a scene or two, show your story to other writers and illustrators for feedback. Be ready to change things and take the criticism for what it is...it's there to help your story, not hurt your feelings. You don't have to do EVERYTHING everyone suggests. But take them all into consideration and choose what works best for your story. Join a critique group or email those you know in the industry and ask for feedback. 3. CUT AND SLASH every word that doesn't move the plot forward. Watch out for too much dialogue or not enough action. Show don't tell. The descriptive words aren't usually necessary. When you use them, you confine the illustration. A picture book should need the pictures to tell the rest of the story. The words don't say it all. Keep your word count low. Picture books are for younger and younger kids these days. The story needs to fit onto 32 pages of a book (with the story starting on page 4 or 5) so make sure you have 14 scenes and the punchline page at the end. Break down your words into groupings with an extra line space when you want a page break. 2. WRITE AND REWRITE: Once I have some main ideas or scenes down, I really begin the writing process. This can be longer and slower for me because I consider myself an artist first and a writer second. But you can't give up. Picture books are some of the hardest books to write. Even though everyone thinks they can write a picture book, they don't realize how hard it is to condense a whole story into 500-750 words. EVERY WORD COUNTS. That's why I say write and rewrite. 1. 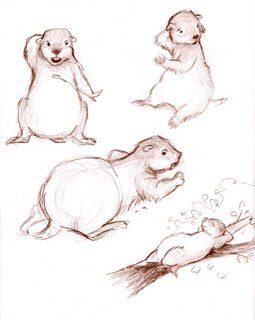 SKETCH AND WRITE: this is a hard stage to describe if you are doing both the illustrating and writing of a book. Many times I'll sketch out ideas of scenes of the character trying to solve the problem before I've even written words. I'm a visual person as well as a verbal person, so a lot of times, I simply go back and forth between words and sketching. However, in this phase, there is often MORE writing than sketching going on overall. For the standard format picture book, you introduce the character and the problem, you have the character try three times to solve it, and in the end he/she does. The final page should be a punchline of some sort or a line that makes you wonder what will happen next. 3. SOLVING THE PROBLEM: After I know who I'm writing about and what the problem to overcome is, I brainstorm ideas on how the character can solve the problem. Then I choose the 3 best or most interesting ideas. (Things seem to balance better in art or in literature in threes or odd multiples). These things will provide the framework for the story. 2. GET TO KNOW YOUR CHARACTER: Once I've settled on a problem and a character, I sketch and sketch that character in various moods and positions. I also try to write down everything I can about that character even if it won't show up in the story at all. I've got to get to know who the character is. So I write down habits, favorite color, favorite food, favorite toy or security item, something they can't live without, personality traits. Everything I can think of. 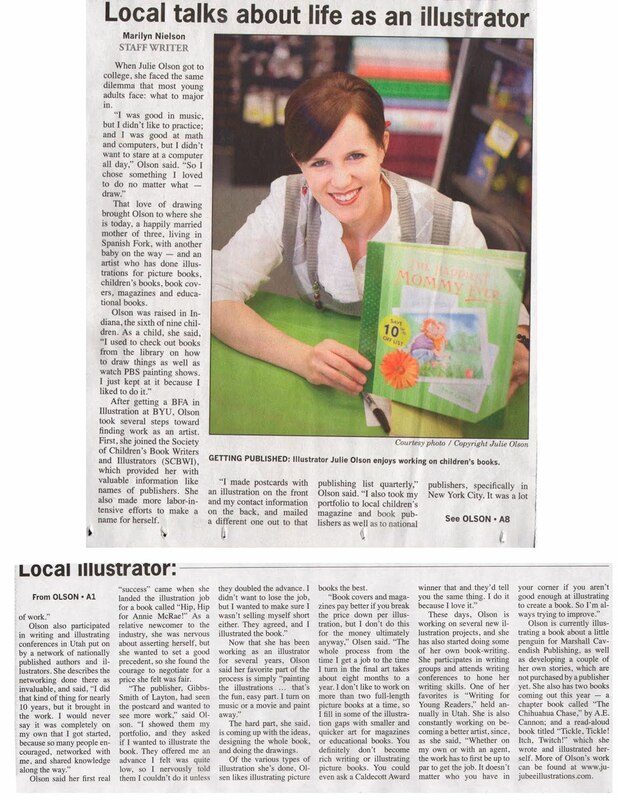 It's hard to put into one article all it takes to write and illustrate a picture book. So I'm not going to. I'm going to break it down and post a step each day for you to follow. 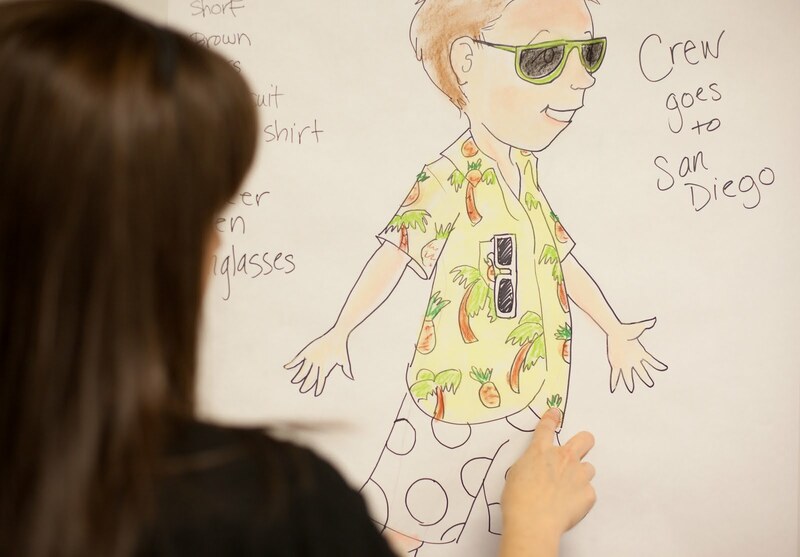 By the end, maybe you'll have created your very own picture book. Now, keep in mind, everyone has their own process and we don't even follow our own process all the time. But I will outline my usual way to go about it. You may ask, "Why do I need to know this? I'm just a writer," or "What's the point? I'm just an illustrator, not a writer." Well the reason is this, a picture book is about the marriage of the words AND the art. If a writer doesn't understand the process the artist goes through and vice versa, the book is never as good. It takes a mutual respect and understanding of each other to create the best picture books. 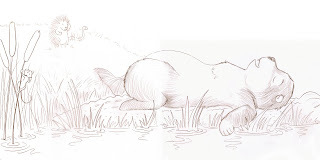 The writer can't overstep their bounds and use too many descriptive words that bind the illustrator and the illustrator must respect and be true to the words' feel and meaning in his/her art. 1. BRAINSTORM: This can be done in a written word style or by sketching different characters. In this stage, I do both. I try to come up with fun titles, main ideas, or themes. I sketch characters like kids or animals with distinguishing features or characteristics. In this phase I also focus heavily on coming up with problems or main obstacles to overcome. Most picture books have a problem and the whole story is centered on solving it. By the way, if you are a writer and not an artist, go ahead and do the art parts in all these steps. It will help you understand your book all the better which will make the end result better. And in the end, just submit the words. 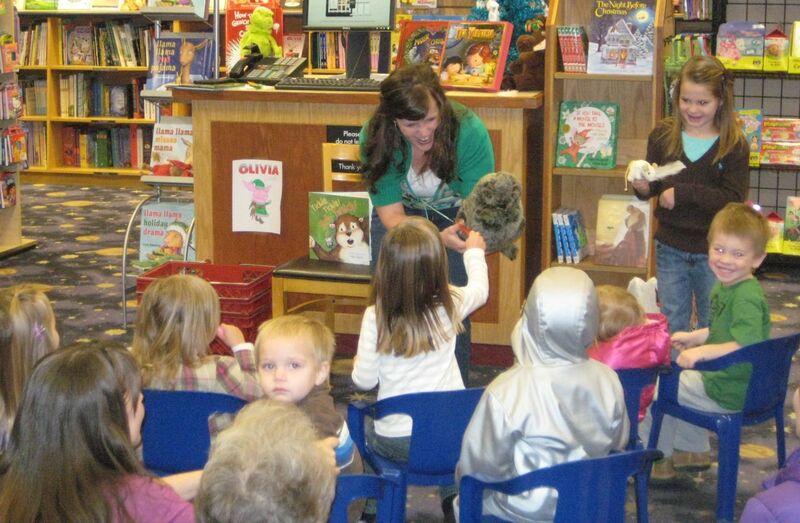 From here on out, I'm going to speak in the most common terms regarding picture books. There are always those books out there that "break the rules." But following the rules is a good place to start. Then you can learn how to bend them later. So get going...brainstorm your ideas today. Come up with one you like. Sketch some fun characters or go through your sketchbook and find one you already like but have no story for. 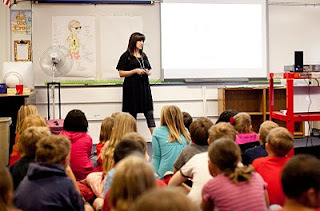 Do this, and YOU'RE ON YOUR WAY to creating your own picture book! 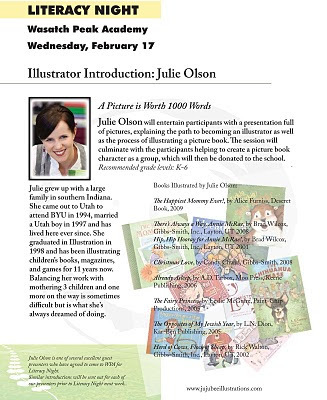 I had to edit my earlier post and delete the speaking engagement I had posted about the UVU Forum on Children's Literature that was supposed to happen in only two weeks. I'm very sad about this. I've worked on putting on this conference with some of my colleagues for nearly 10 years now never taking a dime for any of our work. 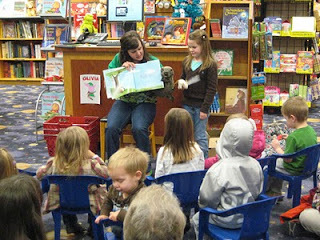 We do it because we LOVE children's literature and we want to help the writers and illustrators in this community along. However, because of low registrations (due to various reasons under the control of only UVU), UVU's Conferences and Workshops has chosen to take over and change the format of the forum. We (the actual conference organizers) don't agree with the changes, any can not support this conference any longer. So this is my sad farewell to the UVU Forum on Children's Literature as we knew it. 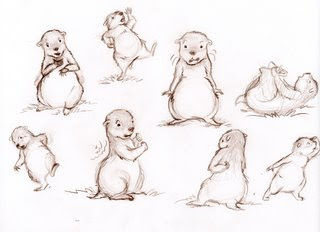 I thought I'd share with you a little sketch in preparation for a picture book I'm working on illustrating. 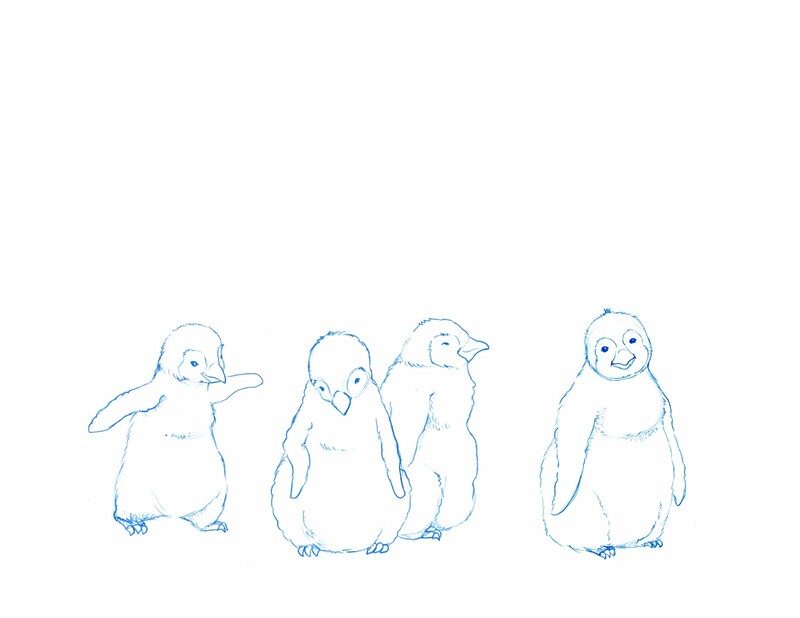 It's all about Penguins. So I've been researching, watching documentaries, printing picture after picture...and I must say, I've fallen in love with these little guys. Their lives seem so lonely yet so intertwined with each other. They live in a freezing, dark, desolate place, yet seem to play and actually have fun with each other. And it's probably just a human thing to do, but I almost see some real human traits in them. In the book I need to show the parent penguin feeding the baby. The issue with this is when they feed, the parent looks like they are eating the baby's head. It doesn't look very nice. We'll see how that page goes. Anyway, here's one little prep sketch amongst some thumbnail ideas. 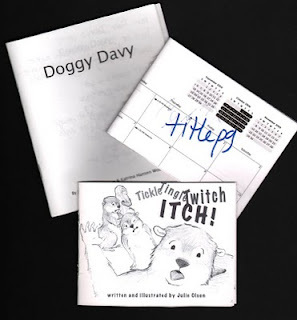 I heard today that the release for the picture book I WROTE and illustrated isn't until November 1, 2010. See...on the cover...there's my name as author AND illustrator. Cool! I was hoping for an earlier release date mostly because I'm so excited about having my own picture book out there in the world. It's exciting. Here's the pdf of the cover I received to approve. I approved. Marshall Cavendish publishing has been great to work with; and they must've liked working with me, because they just offered another book illustration job to me. Yea! Sorry for the long absence of posts. I was sick nearly all of the month of December. Not a nice way to spend the holidays, I know. I seriously was doing only "have-to-do" items and unfortunately, updating this blog wasn't one of those. But since the new year I've felt much better and am working on signing a new book deal along with doing some personal projects. 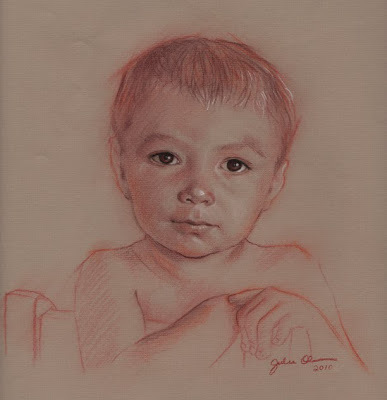 Here is a portrait I just finished of a friend's son. Hopefully it will be to her liking. With portraits you never know.